IEEE Transactions on Multimedia, Vol. 7, No. 2, April 2005, pp. 280-292. Wide field-of-view is necessary for many industrial applications, such as air traffic control, large vehicle driving and navigation. Unfortunately, the supporting structure/frame in most systems usually blocks part of the view, results in `blind spot'' and raises the risk to the pilot. In this paper, we introduce a video-based tele-immersive system, called the Immersive Cockpit. It captures live videos from the working site and recreates an immersive environment at the remote site where the pilot situates. It immerses the pilot at the remote site with a panoramic view of the environment, hence improves interactivity and safety. The design goals of our system are real-time, live, low-cost and scalable. We stitch multiple video streams captured from ordinary CCD cameras to generate a panoramic video. To avoid being blocked by the supporting frame, we allow a flexible placement of cameras. This approach trades the accuracy of the generated panoramic image for a larger field-of-view. To reduce the computation, parameters for stitching are determined once during the system initialization. 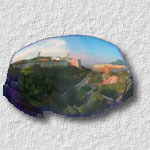 The panoramic video is presented on an immersive display which covers the field-of-view of the viewer. We discuss how to correctly present the panoramic video on this non-planar immersive display screen by sweet spot relocation. We also present the result and the performance evaluation of the system. The following movies demonstrate the motivation, setup, operation and result of the Immersive Cockpit. in Proceedings of ACM Multimedia 2002, Juan Les Pins, France, December 2002, pp. 658-659.